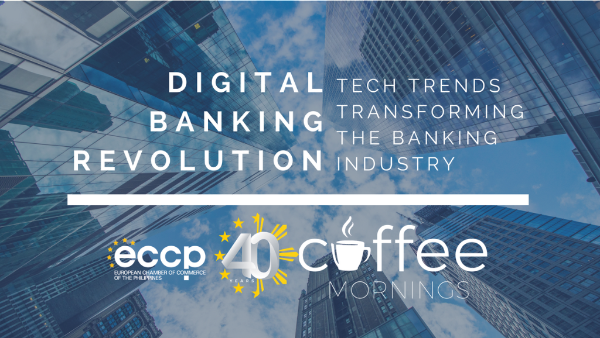 The European Chamber of Commerce (ECCP) is hosting a Coffee Morning Session entitled Digital Banking Revolution: Tech Trends Transforming the Banking Industry on July 11, 2018 at The ARK, Insular Life Building, Makati. Discover emerging tech trends with Mr. Paolo Baltao, Senior Vice President of UnionBank and the Head of the EON Banking Group, the first fully digital, award-winning neo banking platform in the Philippines. He has close to 3 decades of experience in product management and business development and is a true champion of the digital banking revolution. Mr. Baltao will be discussing industry strides in digital and mobile user experience, eCommerce, identity verification, and security in the context of banking and financial solutions. Paolo J. Baltao, Senior Vice President of Union Bank of the Philippines, heads its EON Banking Group. EON is the first fully digital, award-winning neo banking platform in the Philippines. Through its focus on users' security and convenience, EON has become the partner of choice to communities requiring innovative banking solutions. Paolo was the President of G-Xchange, Inc., a wholly-owned subsidiary of Globe Telecom which operates and manages its m-commerce product, GCash. With almost 3 decades of experience in product management and business development, Paolo champions the digital banking revolution. both for members (free pass) and non-members. For inquiries, contact Ms. Nix Cabaneiro at nix.cabaneiro@eccp.com or call 845 1324.